Product: 860205 8 Pack of Lifetime Round Picnic Tables with Swivel Benches and 44" Round Almond Molded Top, Round Bronze Hammer Tone Frame. Lifetime picnic tables are constructed of high impact polyethylene and are stronger, lighter and more durable than wood. 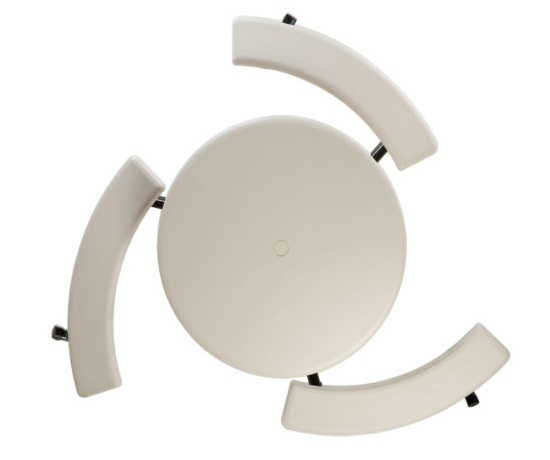 They will not crack, chip or peel, and are built for indoor and outdoor use and are umbrella ready. The patented steel frame provides a sturdy foundation and is protected with a powder-coated finish. 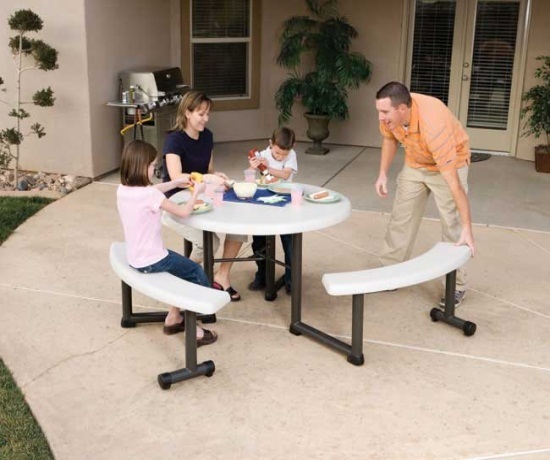 Lifetime Tables are Great for Thanksgiving, Christmas, New Years Feasts, Camping, Boating, Fishing, Picnics, Sporting Events, Recreational Activities and More! 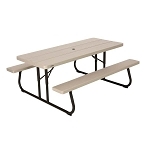 We also offer a broad range of Lifetime Picnic Tables. 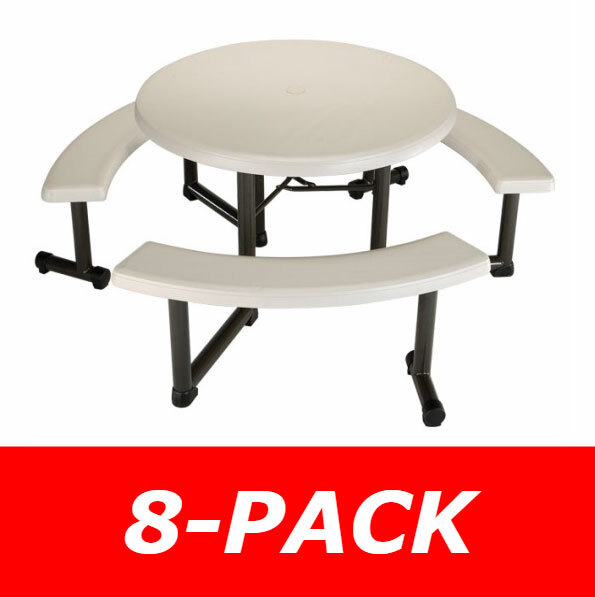 Lifetime Round Picnic Tables do not fold up flat like the rectangular picnic tables do. 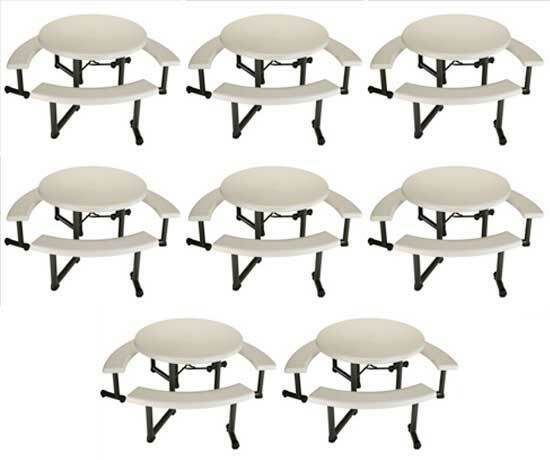 These tables work great as patio furniture or as outdoor restaurant furniture. This is a great table. We have been using outdoors for almost a year now, and the tables still look new. In addition to being durable, the price was great. I would highly recommend this table. These table are made of good quality material , and appear to be durable . I just install 8 in our yacht club and they gave the deck and million dollar look and they are so flexible . Heavy enough to stand strong winds and light enough to move around easy. They have a strong frame and the powder coat is nice . The hole for umbrella is perfect . Assembly require but not hard . This table is in use at my mom's store. It sees daily use and still looks new! The swivel benches are a great idea. Q: 8 pack? does that mean 8 picnic tables? 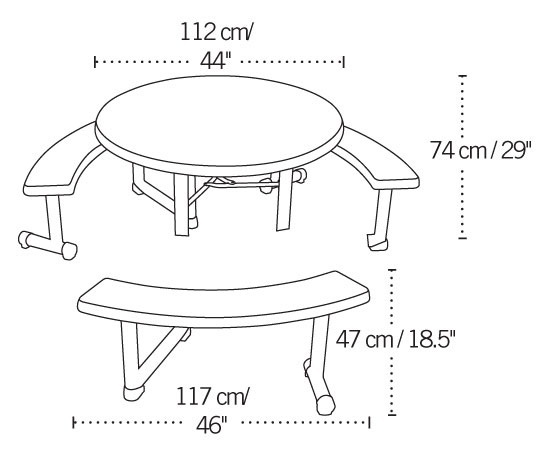 A: Yes, this includes 8 of the 22127 picnic tables. Buying in Bulk allows us to give you a better price. Shipping is free in the 48 states. Q: Hi, how early would these ship if I purchased them today? I would like to get them as soon as possible. thank you. A: The shipping times vary by location, but It usually takes about a week to 10 business days depending on your location for larger items. Q: Can I put an umbrella in this table? Is there a specific size? A: Absolutely you can put an umbrella in this table. It has a pre drilled hole and fits standard umbrella sizes. There is a cap that will cover it if you decide to remove the umbrella.